JPMorgan Chase & Co. (JPM) and Goldman Sachs Group Inc. (GS) compete for banking and trading business from almost all of the world’s largest companies, with one notable exception: Chesapeake Energy Corp. (CHK), the second biggest U.S. gas producer now facing a cash-flow shortage. For more than a decade, JPMorgan bankers have declined to do business with Chesapeake and its chief executive officer, Aubrey McClendon, 52, said people with knowledge of the matter. In contrast, Goldman Sachs, which once loaned money to McClendon against his wine collection, recently helped arrange a $4 billion loan for Oklahoma City-based Chesapeake and is advising on its efforts to sell assets. JPMorgan, the biggest U.S. lender by assets, is missing out on a shot at hundreds of millions of dollars in fees paid to banks over the years by Chesapeake, one of the energy industry’s most active dealmakers. Avoiding Chesapeake also limits JPMorgan’s risk should the gas company’s finances worsen. Concerns about Chesapeake’s fast growth and credit quality played a role in JPMorgan’s decision not to pursue business from the energy firm, said the people, who asked not to be identified because the discussions were private. Competition is already fierce and other banks have an edge, reducing the attractiveness of pursuing Chesapeake work, one person said. Officials at Chesapeake and New York-based JPMorgan declined to comment. McClendon is known as one of the energy industry’s biggest risk-takers. Forbes magazine last year called him “America’s most reckless billionaire.” He founded the company in 1989, going on buying sprees that eventually amounted to a portfolio of oil and gas fields that covers an area half the size of New York State. Along the way, McClendon has outspent cash flow in 19 of 21 years, relying on asset sales or financing transactions to stay afloat. That has sometimes left the company, with unsecured debt rated as junk by Standard & Poor’s and Moody’s Investors Service, exposed to swings in oil and gas prices. Beset by low oil prices, the company put itself up for sale in 1998, failing to secure a buyer. One of the last pieces of investment-banking work that JPMorgan, then known as J.P. Morgan & Co., did with Chesapeake was a 1996 stock offering, data compiled by Bloomberg show. In 2008, McClendon asked JPMorgan to renew the relationship after the bank bought Bear Stearns Cos. Bear was a frequent participant in Chesapeake bond and stock offerings, some of which JPMorgan completed after the purchase, said a person with knowledge of the deals. Steven Black, then co-CEO of JPMorgan’s investment bank, and Douglas Petno, head of JPMorgan’s natural-resources investment banking group, met with McClendon to discuss the matter, the people said. The practice remained in place. Other senior managers involved in the decision included Kelly Coffey, who ran corporate derivatives marketing and the North American reputational risk committee; Stephen Eichenberger, a credit-risk executive, and Larry Landry, a leveraged-finance banker, the people said. All five didn’t respond to requests for comment. This group of JPMorgan officials and others inside the bank met repeatedly to discuss Chesapeake’s growth, its credit quality and the proper value of its holdings. One view of the executives was that Chesapeake’s assets, including pipelines and real estate, were strong yet might not provide enough collateral if the company was forced to sell assets later, the people said. In one meeting of JPMorgan executives in 2008, it was decided that Chesapeake didn’t meet at least portions of the bank’s so-called five P’s of lending: people, payment, protection, purpose and perspective, the people said. Those five P’s, which other banks often call the five C’s -- character, capacity, collateral, capital, conditions -- are used to examine whether a borrower is creditworthy. JPMorgan never found evidence of wrongdoing at Chesapeake, the people said. The bank’s position is more of an understanding among its staffers than a formal policy, said people familiar with the situation. Chief Executive Officer Jamie Dimon, 56, was aware of the practice while not involved in making the decision, one person said. The stance on Chesapeake applies across all of JPMorgan’s units, including lending, credit-derivatives and merger-and-acquisitions, said people familiar with the matter. Junior bankers in the oil and gas investment-banking group are told not to seek meetings with Chesapeake executives to pitch JPMorgan’s services, as they would most other energy firms of Chesapeake’s size, people familiar with the matter said. Banks occasionally will reject a potential client, said Bradley Hintz, an analyst at Sanford C. Bernstein & Co. and a former chief financial officer at Lehman Brothers Holdings Inc. This year, there will be more business. McClendon is facing natural gas prices near historic lows, and is under pressure to sell billions of dollars of assets to meet obligations. The company’s cash-flow shortfall could reach $22 billion by next year, according to James Sullivan, an analyst at New York-based Alembic Global Advisors. He’s also contending with a governance crisis. Shareholders including billionaire Carl Icahn replaced a majority of the board and stripped McClendon of his role as chairman after Reuters reported in April that he had borrowed against personal stakes in company wells. Goldman Sachs has developed a tight relationship with Chesapeake, working with the company since at least 2005, when it helped with a $262 million stock offering. In addition to the recent loan and the asset-sale talks, Goldman Sachs also won major roles in the planned initial public offerings of Chesapeake’s oilfield-services subsidiary and FTS International, a pressure-pumping business 30 percent owned by Chesapeake. In 2009, a Goldman Sachs debt fund helped finance a private-equity firm that bought rights to future oil and gas production from some Chesapeake wells for $412 million. The Goldman Sachs connection extends to McClendon’s personal wealth. In 2008, the firm filed a notice that it had extended credit to McClendon against his wine collection, at one point considered among the biggest in the U.S. Construction of a $3 million, 31,000-square-foot warehouse to maintain the collection was halted around the same time. Goldman Sachs helped McClendon liquidate his personal holdings in Chesapeake stock later that year when he sold his stake to meet margin calls, according to a regulatory filing. Aubrey McClendon, chairman and chief executive officer of Chesapeake Energy Corp.
How can small businesses compete in today's global landscape? First and foremost a successful business must have a sound knowledge of its market and understand how its product or service will be different, stand out and improve people's lives. If you ensure it responds to a real need in the market place then your business can punch well above its weight. I am a great believer that you need this passion and energy to create a truly successful business. When I started Student magazine, it was aimed at giving young people a voice on key issues such as the Vietnam War. We ended up selling advertising to make the money to publish it and pretty soon it became a business. Remember many new businesses do not make it and running a business will be a tough experience, involving long hours and many hard decisions – it helps to have that passion to keep you going. Lastly, learn to delegate early and bring in strong managers to help you grow the business and give you time to focus on key issues. I learnt this as a young businessman and it has enabled me to diversify Virgin into many different areas and withstand many of the problems that can engulf a developing business. My parents always taught me never to look back in regret but to move on to the next thing. When something doesn't go exactly to plan, money is tight or a business is struggling – see it as a challenge. Look outside the box to try and find a solution, you'll be surprised how many great opportunities and possibilities arise when things look bad. You have just got to open your mind and not be afraid of sticking your neck out! Remember that a setback is never bad, it should be a learning experience. Is starting a business during a recession ever advisable? It depends on what the circumstances are. For a startup business that has sufficient funding and a really great idea, there is no bad time to start. Funding is harder to come by at the moment, particularly with banks less willing to lend to small businesses, but tough times can provide great opportunities: big companies are preoccupied with their own problems, premises are cheaper and there is more talent on the market to hire. I have worked through a couple of recessions – in the '70s and late '80s – and in each case I learnt that there are business opportunities in all the gloom and doom. What are you top sales tips? • Make sure you know what your customer wants. Be focused on delivering an extremely high standard of product and service. Keep listening to them and react fast when things go awry. • Employ staff who believe in what they are selling and who would buy the product themselves. That knowledge and passion helps to sell your business far better than any advertising campaign. • Don't be afraid of taking risks. Come up with loads of ideas and encourage your team to do the same – it doesn't matter if some do not work – the very process of challenging the status quo will help you hone your product and improve your sales. At Virgin we try to encourage people to think for themselves and not behave like automatons. I always say your employees are your number one asset and the way you treat your employees will impact the way they treat your customers. One thing I learned early on was to make sure a business did not feel too big and ensure your management feel in control. At our record company when it got to 100 people, I would often split it in two and create two managing directors to give them a sense of ownership. This keeps things fresh. In business know how to be a good leader and always try to bring out the best in people. It's very simple: listen to them, trust in them, believe in them, respect them and let them have a go! They are the ones who will become the backbone of the business and will want it to succeed. LONDON, June 25 (Reuters) - Money markets are increasingly pricing in a near-term cut in the European Central Bank's deposit facility rate, but some players warn that such a move may do more harm than good by lowering banks' incentives to lend. With the euro zone economy faring worse than expected, the three-year-old sovereign debt crisis intensifying day by day and waning hopes that politicians can get a definitive grip on events, markets are increasingly banking on support from the ECB. Analysts say forward euro overnight Eonia rates are pricing in an over 50 percent chance that the ECB will cut its deposit facility rate from 25 basis points to zero later this year along with its 1 percent refinancing rate. But while this would be intended to give a further push to banks to lend to each other and then to businesses to help the real economy grow, it may actually have the opposite effect. Analysts say the few banks that are willing to lend in unsecured lending markets may stop doing so as their return on such transactions may fall below the cost. More importantly, it could create distortions in the most active sector of the money markets, repo transactions, in which investors raise cash backed by collateral, usually government debt. The rate to borrow cash using top-rated general collateral (GC), such as a basket of German or French government debt, has recemtly traded 20 basis points below Eonia, the overnight rate for unsecured lending, because of the quality of the bonds on offer. Eonia, in turn, has settled 10 bps above the deposit facility rate on average in recent months - on Friday it fixed at 0.325 percent. Once the deposit rate is cut to zero, Eonia is expected to fix at around 0.1 percent. "That would mean that the GC rate will be negative, limiting the ability to get money using the bonds. It can create a distortion in the repo market," said Alessandro Giansanti, rate strategist at ING. Any repo market distortion could also lower volumes in sovereign bond markets, as investors who buy government debt to raise cash will no longer have a reason to purchase them. "This could add to the negative momentum observed in sovereign bond markets, which is reinforced by increased volatility and already impaired liquidity," Commerzbank rate strategist Benjamin Schroeder said in a note. "Within the context of the broader sovereign crisis, it would be worrying if the ECB risked endangering the still very fragile bond markets in return for questionable positive effects for interbank lending." Not all analysts are worried that a cut in the deposit rate will have side effects on repo markets. Max Leung, a rates strategist at Bank of America Merrill Lynch Global Research, said repo rates on a few German bonds - posted as collateral individually rather than as part of a basket - have already turned negative and volumes have not dropped. "Negative rates is never a good thing because you penalise people for lending, but there are securities which are already trading at negative levels because of flight-to-quality flows," Leung said. "As far as banks are concerned it still represents business. For the repo desks, they can still charge relatively wide bid/offers so we don't think volumes will necessarily fall because of that." Just goes to show the level of intelligence of Twits that they can't even be bothered to read someone's profile before abusing them. If I had to sit next to her, I'd drop dead too. To be fair she does not look 22. She looks old enough to be my mum and I am 26! I hope the customers get a nice payout for every day that they cannot use the services. 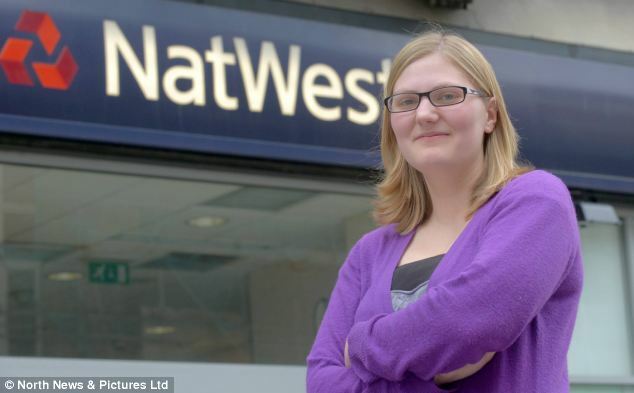 I would ask for same charges that Natwest uses when a customer goes over the overdraft or has a direct debit returned. 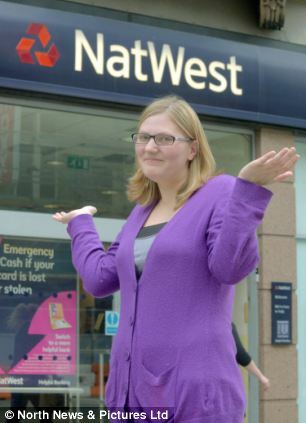 By the way Natwest and RBS, you deserve everything you get, that's what happens when you fire 1,000s of IT staff in order to increase profits even further. Outsourcing and relying on IT consultants that don't know your systems very well does have its drawbacks doesn't it. Div!!! Sort yourself out! Call yourself a teacher? "English and Media teacher" - working the usual 80-hour week that teachers always claim they do yet has time to post rubbish on Twitter? And she is so media-aware that it never crossed her mind, or what passes for it, that her user-name was the same as that of one of the big banks? Really? June 25 (Reuters) - The Chamber of Commerce, a leading corporate lobbying group, extended its campaign against Glass, Lewis & Co. on Monday, asking the U.S. Department of Labor for a review of the proxy adviser's recent behavior. Similar to a complaint it lodged with the Securities and Exchange Commission last month, the Chamber asked the Labor Department to investigate whether Glass, Lewis had a conflict of interest when it urged opposing the election of some directors to the board of Canadian Pacific Railway. The complaint comes amid a heated proxy season that has seen shareholders deal surprise defeats to management, often at the urging of Glass, Lewis or its larger rival ISS, at companies ranging from Citigroup to Nabors Industries to Chesapeake Energy. In reaction, Glass, Lewis and ISS, which is owned by MSCI, have come under increasing fire from business groups. San Francisco-based Glass Lewis is owned by the $117 billion Ontario Teachers Pension Plan, which owned shares of Canadian Pacific and had backed its own dissident slate of directors in a bid to oust the railway's board, the Chamber noted in a letter to the Labor Department. "The fact that the owner's interests were made known to the public just prior to publication of the subsidiary's vote recommendation gives the appearance that Ontario's own unique interests are being deliberately reflected in Glass Lewis' vote recommendations, and that the mutual positions are being coordinated in some manner," Tom Quaadman, vice president at the Chamber's Center for Capital Markets, wrote in the complaint to the Labor Department. The department is charged with overseeing pension plans and other employee benefits programs to ensure they are managed appropriately. Quaadman wrote a similar letter complaining about the potential conflict of interest to the SEC on May 31. Glass, Lewis and the Ontario fund have both denied any wrongdoing in the past. Neither could be reached for immediate comment on the Chamber's latest complaint.